The New York Yankees used five runs in the bottom of the fifth inning to push past the Texas Rangers 7-2 on Sunday afternoon at Yankee Stadium in the Bronx. 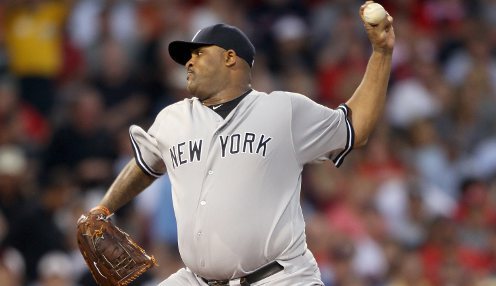 Leading the way for the hosts was a strong start from CC Sabathia (7-4), as the 38-year-old left-handed veteran from Vallejo, California lasted six innings, while allowing zero earned runs on one hit, conceding three walks and striking out a game high seven batters for the contest. New York is on a two-game winning streak and has put together six victories in their past ten games. The Yankees are still 9.5 games behind the rival Boston Red Sox for the lead in the American League East, but the hosts still hold top spot in the American League Wild Card race over the Oakland Athletics. Martin Perez (2-5) had a rough outing for the visitors from Texas, as the 27-year-old left-handed hurler from Guanare, Venezuela threw for only five innings while surrendering seven earned runs on 11 hits and fanning two batters for the game. The victory gave New York a 3-1 series victory against the Rangers and a 4-3 season series triumph. Texas will head home to square off with the Arizona Diamondbacks in a two-game interleague series. Bartolo Colon will have the ball for the Rangers and Zack Greinke will be the counter for Arizona. Meanwhile, the Yankees have a one-game make-up against the New York Mets on Monday, before welcoming in the Tampa Bay Rays in Tuesday. The Yankees are 10000/1 to win the American League title, with the Red Sox 5/9.